Hot on the heels of Grange Park Opera’s Fiddler on the Roof comes another tale centring on persecuted jews, this time drawn from the Old Testament. 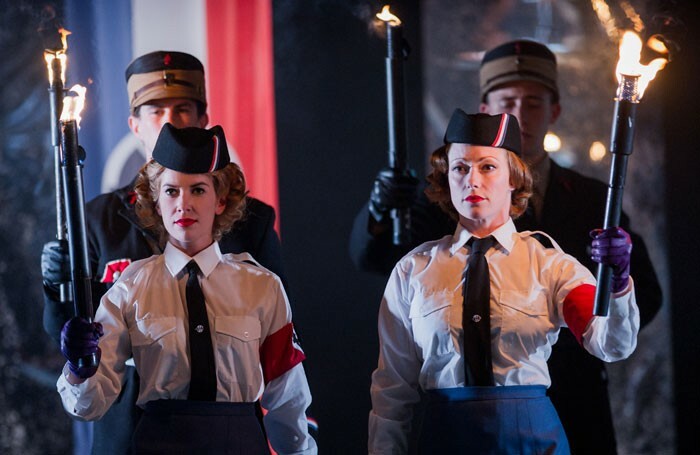 In Patrick Mason’s updated version of Saint Saëns’s Samson et Dalila, the oppressors are not philistines but officials of a Vichy-like regime. This allows not only for a ritual of book-burning, but also for stylish costumes (Frances O’Connor) – not least for Delilah’s trio of tidy-suited executive attendants and for her bevy of naive, country-dwelling girls. For his part, the anti-semitic High Priest puts his curse upon the jewish people on record before an obliging press corps, and is able to produce photographic evidence of Samson’s history with Delilah – technology neatly aiding propaganda and surveillance. Less convincing is the bacchanale, where general revelry is replaced by a movie screening. We see only the audience reactions: well rehearsed as they are, their novelty quickly fades. What most detracts from the show dramatically is Sara Fulgoni’s Delilah, who makes scant attempt to arouse Samson’s passions and takes no pleasure in her deception. Her sound, rather than radiating outwards, often appears partially ingested. By contrast, Carl Tanner’s heroic, ringing quality well serves the role of Samson, and there are distinguished performances from Michel de Souza’s rich-toned High Priest and Christophoros Stamboglis’s resonantly expansive Old Hebrew. Gianluca Marciano conducts with a clear delight for Saint-Saëns’ scintillating orchestral colouring.